I mentioned in a post earlier this week that I added two foundations to my recent E.l.f. Haul. Umm, make that three–I have no self-control on my quest for the perfect drugstore foundation. First I bought the Beautifully Bare Foundation Serum, which I really disliked. I have a review on that one here if you’d like details. I also bought the E.l.f. Moisturizing Foundation Stick, and I haven’t really decided how I feel about that one, but it’s not my favorite. But I mentioned in that post that I also tried a foundation I loved. So here is that review: I am completely in love with the E.l.f. 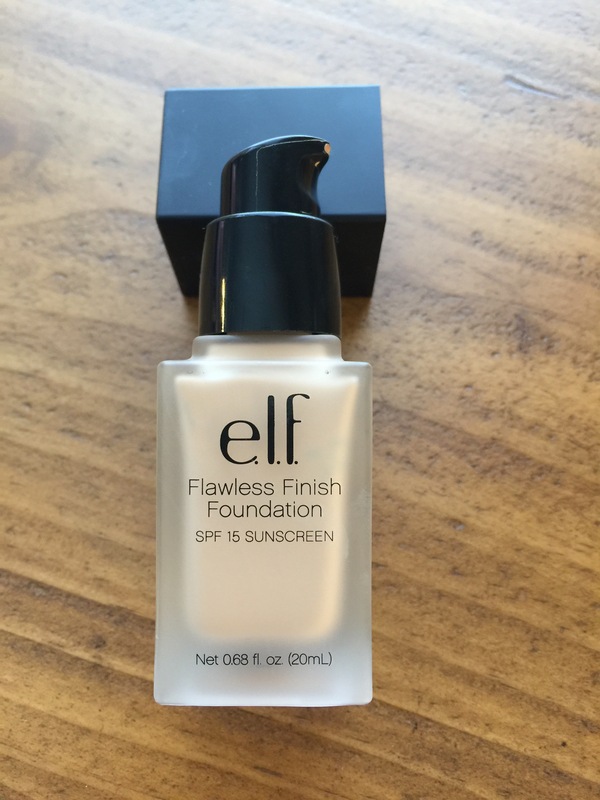 Flawless Finish Foundation! As I’ve said in the past, my biggest issue with foundation is creasing: every foundation I try to some degree settles into my fine lines in my forehead and around my mouth and exaggerates them. I look like a young person who has on stage makeup for a play in which she plays an 80-year old woman. You know what I mean? I look like I drew on lines to make an otherwise young face look old. It really bothers me, and I have been on a mission to find a foundation that does not age me like this! That’s not asking too much, right?!? I decided to try the Flawless Finish Foundation because I kept hearing rave reviews–that it made your skin look airbrushed, youthful, generally just flawless. The foundation does exactly what the reviews promised: it leaves you with an airbrushed complexion, it is neither too matte nor too dewy, and it wears well throughout the day. It did break up a tiny bit around my nose and chin, but I had to be really, really close up to notice it. If I stepped back from the mirror at a normal distance, it looked perfect all day, from 7 am to 9 pm. The packaging is so pretty–it has a sleek square shape and frosted glass bottle, and it has a pump that actually works! I realize this may sound crazy, but after trying enough products where the pump gets filled with air and spits product at you, it’s nice to find one that works like it’s supposed to! I have the shade Sand, which is a good match for my light (but not fair), neutral-to-warm skin tone. You do only get 0.68 ounces–most foundations are 1 full ounce– but for $6, I am not complaining about this. I only need 1-1.5 pumps to cover my whole face, so it will still last awhile. I think it would work well for many skin types. As a person with normal skin (it’s usually dry but the recent humidity in Texas has caused me to be a bit more oily than usual), I think this product was neither too drying nor too dewy. I used a good moisturizer which I let soak in completely, then added the Hard Candy Sheer Envy Skin Perfecting Primer (I have a full review of this product here) to help fill in fine lines, and then I applied this foundation with a makeup sponge. Concealer sat well on top of it, as did powder. I only use a setting powder on my T-zone, so I applied bronzer and blush on top of the bare foundation, and they blended beautifully as well. The foundation dried down quickly and did not cause those powder products to go on patchy. And the crease test? Yes, it did sink in to my fine lines a tiny bit, but not as much as some other foundations, and it was quite easy to blend out when it did without making me feel like I was removing the product. (You know how sometimes you try to smooth foundation out of fine lines only to realize you’ve removed the product completely and are left with a patchy face? This one definitely did not do that.) So while it is not a total miracle worker, the airbrushed, healthy finish and staying power made up for any minor creasing. And perhaps asking a foundation to completely hide any fine lines might be a bit much. It did not accentuate them, and I’m happy with that. Final Word: I highly, highly recommend this foundation. I can’t stop staring in the mirror. And for only $6, what have you got to lose? Let me know if you do! It is quickly becoming my go-to foundation!